We left the hotel this morning at 7:15 in order to be at the security line going to the Temple Mount platform as soon as it opened. After that visit we followed the traditional Via Dolorosa. After a visit to the Church of the Holy Sepulchre we went to the Jewish Quarter to see the Broad Wall, the Burnt House (from A.D. 70), and the Herodian Mansion (or perhaps the house of priests). We came down to the Western Wall Plaza to visit the Western Wall, then the Davidson Center excavations. This photo of the Western Wall and Temple Mount platform was made from the southwest. You can see a portion of the Western Wall, the Mughrabi (temporary) Bridge, and the Dome of the Rock (where the biblical Temple once stood). 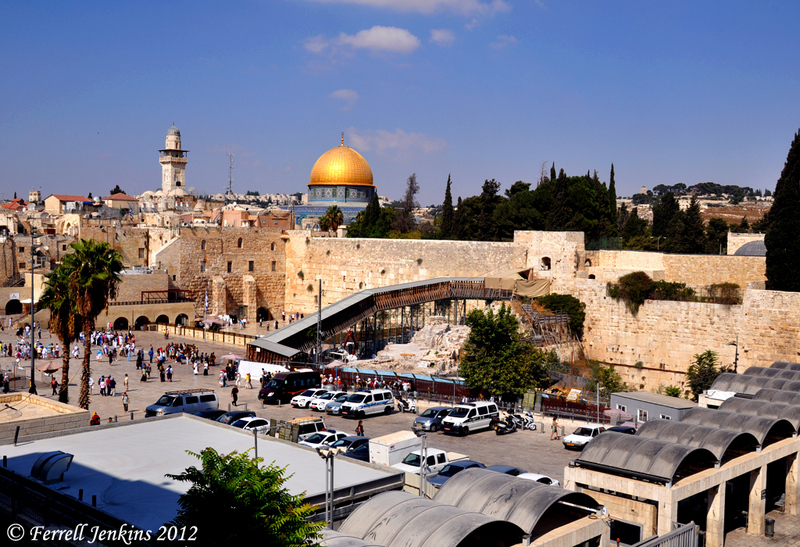 Temple Mount in Jerusalem from the SW. Photo by Ferrell Jenkins. On the right side of the photo, in the distance, can be seen the hill between Mount Scopus and the Mount of Olives. I think this is where the Augusta Victoria Hospital is located. This entry was posted in Archaeology, Bible Places, Bible Study, Church History, Israel, New Testament, Old Testament, Photography, Travel. Bookmark the permalink.